Camper/Trailer Parking has electrical and water hook-ups for 3 stations that allows for 3-6 RV's depending on size. There is no dumping station. This area can also be used as overflow parking for approximately 8 to 10 vehicles. 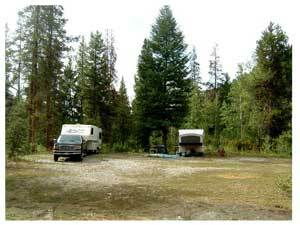 Directly across from Camp Sawtooth is a Forest Service campground which is usually available, Forest Service Camp fees will apply.